October | 2012 | Island of Doom Software Inc.
talk to myself now available, free for iPhone and iPad! After a long journey through the App Store review process, talk to myself is finally available! This app came from a simple idea: what if you could talk to everyone else who has the same name as you? That’s exactly what talk to myself lets you do. When you start it up, it confirms your first name and then you’re in a group chat with everyone else using the app who has the same first name! It might be a bit quiet to start with, since it just launched today and you’re quite likely to be the first one with your name to arrive. But don’t worry, you’ll get a push notification when someone else joins and pipes up, and then you’ve got a conversation! 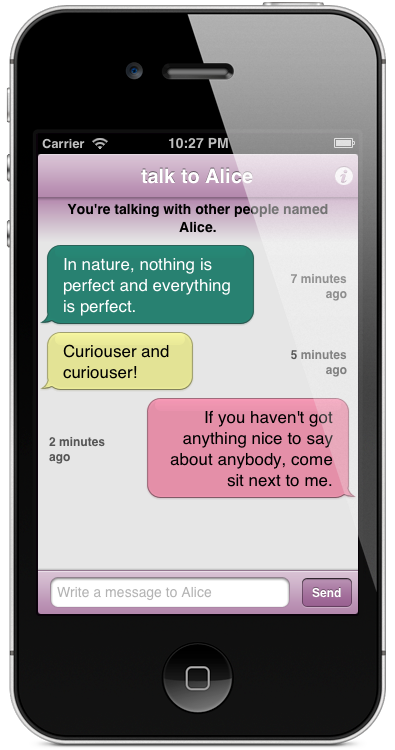 talk to myself is a free download for iPhone, iPod touch, and iPad on the App Store. Give it a try and talk to yourself around the world!